Teaching primary students, pencils have been a HUGE headache for me in the past. Every single day someone would find their pencil missing, or needed it sharpened when I was in the middle of teaching a small group, and when I placed new pencils in the sharpened bin half the class seemed to all of a sudden be missing a pencil! To solve these pencil problems I started a new system based on some ideas I'd read about on Facebook and Pinterest, and now I never have to think about pencil problems! At the beginning of the year, I provided every student in my class with a pencil case from the dollar store. I labeled them with each student's name so there could be no mix-ups! Inside every case I included seven sharp pencils and one eraser. The second year I did this I changed it up to 5 pencils and it has worked just fine! At the end of every week, my lunch helpers collect the pencil cases and sharpen all of the pencils. Any student who still has all seven (or five) pencils AND their eraser gets a small treat back in their case - an eraser, sticker, small wrapped candy. Any pencils missing, or nearing the end of their usable life, are replaced at this time and pencils are NEVER needing to be sharpened throughout the week! (Insert happy teacher face here!) I shared this idea at the beginning of this school year, but I'm so thrilled with how well it is going I needed to revisit! Pencil problems - solved! I use almost the exact same system! We use pencil boxes instead of pouches. I'm always amazed at how excited the students are to get a sticker and a Friend of Pencils card. Thanks for starting a new linky! Oh, I can believe it!! I can tell you that my students have been just as excited and motivated by a sticker, special pencil or fun eraser as they have been for a candy. Any little surprise gift works wonders! Erin, I love this fantastic idea! Thanks for stopping by! Not a silly question at all! I got them from our dollar store, Dollarama. :) It is a routine that I will establish year after year. It has made my life SO much easier! I can't wait to try it next year. Going to add a few items. Dry erase marker and eraser. Did you have to buy any additional pencils as you restocked the pouches or did the students provide enough at the beginning of the year? I actually purchased all of the pencil cases using some of my classroom funds. I believe they were $1.25 each at our dollar store. You certainly could request that families send one in, but I would definitely have a few extras on hand, just in case! I do something similar, using pencil boxes and tucking one inside each chair pocket. I also include crayons, scissors, and one glue stick. For the pencils, though, I include a couple 'regular' pencils with erasers, as well as a 'golf' pencil, and one thicker primary pencil. I don't have assigned seats, so the 'tool kits' (as we call them) belong to everybody, and are everybody's responsibility. This works better some years than others. Love the idea of personalizing it, though, AND regularly checking and giving rewards. Might try that next year! I do have community bins for the other supplies, like glue sticks and colored pencils, but this has been the best system I've ever used for regular pencil management! What happens when all 5 are broken or need sharpening before then end of the week? The whole point of this system, for me, is that I am not playing the "Rescue Ranger" and my students need to show responsibility for their supplies. Almost never does anyone have a week where all 5 pencils are broken or so dull they can't work with them, and if that happens my students are quick to help each other out by lending to a friend or making a trade. What are your ideas for doing something like this ,but for middle school? I have 130 7th graders. Any ideas to modify your (awesome) idea? Let me know if you come up with something and I'll add it to the post for others! I teach middle school ELA and what I do is I assigned each student a number, which I use all through out the class, and so at the end of the period I check the bags, and then teach the students at the beginning of the class to make sure everything is there. That way I'm not doing the work. They soon learn who else has their bags, so it's funny to watch them react to a friend or someone else losing 'their supplies'. What do you do about that student who has no pencils in his or her pencil pouch. I'm thinking I would just give them one. What if the 5 pencils in the pouch at the end of the week are pencils I had given him or her rather than the 5 they started the week with? I hope this makes sense. I can tell you this almost never happens! 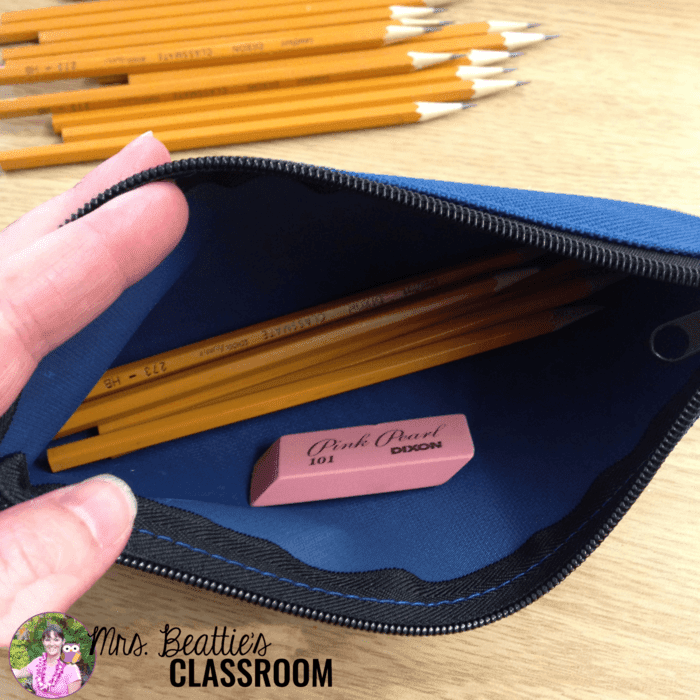 I had one student who would occasionally hand the pencil case in at the end of the week with only one or two pencils. While my position is that any missing will be replaced at that time, we almost always found them hiding in his desk. Throughout the week, though, I don't provide pencils. The whole point of this system, for me, is that I am not playing the "Rescue Ranger" and my students need to show responsibility for their supplies. If someone is missing theirs, they borrow from a friend until their supply is replenished. I love this idea. I have one boy who likes to be Edward PENCILhand and he ends up breaking them. I tell them to use a crayon. It's worked. I boy only took 1 week. Still working one. I have one that "lost" all his pencils one week and he was told to use a crayon. Turns out all his pencils were hiding at the bottom of his desk and he was to lazy to look. So now if they are out they know to use a crayon. But it's only happened 2 times I think. I don't have a helper. I make the kids turn them in to me and I just bring them home and put a ticket in it and on Monday they get to pick their own piece of candy. WORKS GREAT. LOVE IT!!!!!!!!!!!!!! Takes me maybe 10 minutes to get through 20 bags. Did anyone come up with a middle school adapatation? Do you have a student check each bag at the end of the week? Sorry, I meant do the students put the surprise in the bags or do you? 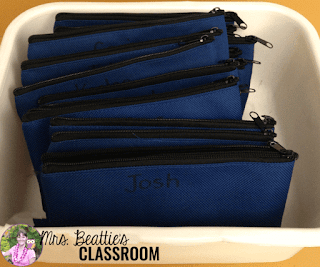 As far as the whole high school or middle school thing goes....could you simply number the pencil pouches instead of name them? Then you would still need only 30 pencil pouches and you're teaching your kids that their classroom is a communal space and therefore supplies need to be treated well. That would also mean that groups of kids would be assigned one pouch to take care of which may hold them more accountable with their peers. Just a thought? That's a great idea, Abby! Thanks for sharing! 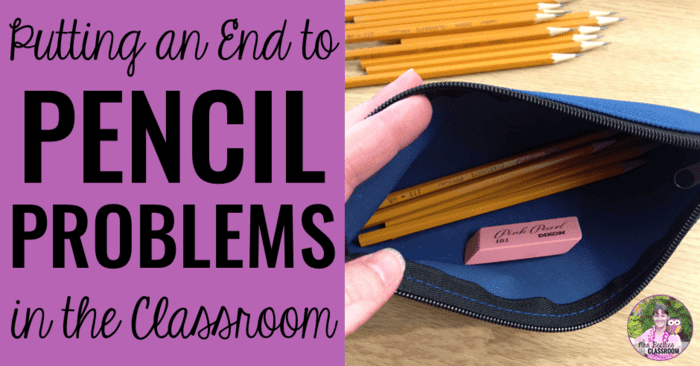 How do you keep them from taking pencils from someone else's case? A classroom culture of kindness, respect and caring for each other! It has never happened! Love this idea! Though I don't think it would work well, as it is, in my middle school. All my students have different teachers for each subject and different schedules, so teaming up with even a few other teachers wouldn't work. I am still going to think about some type of adaptation. Pencils are in high demand in my intervention classes! There are a few suggestions in the comments, Shirley! I think that's a great idea, Karen! Thanks for sharing your thoughts. The labeling just takes so much time... this eliminates that for me! Yep! This is an elementary blog! Do you have them keep the pencil bags in their desk or a centralized location so they don't get lost? I have a feeling my kids would take the bag home and lose it. My students just keep them inside their desks. They know that they're NOT to go home and it has never yet been a problem! Thank you! This is a great idea and I think it will help solve my pencil problem in 2nd grade. Glad to help! Thanks for stopping by! When my dad retired he became a substitute teacher. This was always a problem for him. His solution was to offer kids a pencil to borrow for the hour but they usually ran off with them. So he began a system if you borrow a pencil you leave your shoe with him and it is returned when the pencil was returned. It solved the pencil consumption problem for him. Not sure about sharpening? He would have liked your idea! Yeah, I've heard the shoe suggestion quite a bit, but I'm not sure how that would go in a lot of classrooms these days... It is a safety issue and I can think of several families that would have a problem with their children being centered out that way! I am a middle school teacher and tried the shoe thing. I had a girl who had a crush on a boy in the class, steal his shoe instead of taking her shoe back. BIG mess. No longer do that. I'm not a teacher but a mom. My daughter and my niece both do homework at my house after school and I really like this idea. Last year was our first year of school and a BIG learning experience for all of us. Everyday was a struggle to find pencils, crayons, scissors, glue, etc... I am thinking of trying this and teaching them to be more reponsible with the tools they need for homework. Thanks for sharing. I am not a teacher but a frustrated mom. My daughter and niece do their homework at my house after school and I really like this idea. Last year was our first year of school and a BIG learning experience for all of us. Everyday we would have to search for the pencils, crayons, scissors, glue, etc... I am really thinking of trying this with them this year in hopes of saving time and my sanity. Thanks for sharing this idea. I love that this is helpful for you at home, April! Thanks for taking the time to leave me a comment! So glad you stopped by! What time of day would you have your kids sharpen? I am going into first grade and trying to figure out what instruction period I would have to cut into for any job. Thanks! I actually have older students come to my classroom during the lunch break to help out with home communication and other small jobs daily, and I have them do the sharpening during the recess break, so no instructional time is impacted at all! Do you let the students use their own pencil sharpeners to sharpen pencils throughout the week? If my students have personal sharpeners and use them correctly (no piles of shavings inside their desk or pencil case) then I have no problem with them being used throughout the week. That said, I don't encourage my students to bring them since they are usually more of a headache than a help! I'm so glad this is useful to you, Angela! Thanks for stopping by! I think you could use any sort of container you wished! Glad you stopped by! I am a teacher and a mom. My daughter was in Kindergarten last year, and I provided her with a pencil pouch with 5 pencils that were neon color and labeled with her name. Every other day it was her job to sharpen the pencils at home. She used the same 5 pencils for about 2 months! The reason I did this is because of all the germs that get spread by students sharing pencils from the "sharp" and "dull" bins that the pencils were located. She only got sick once during the entire school year! This is such a neat idea! I'm definitely giving it a try this year, but with our small pencil boxes. Thanks for sharing! I am a middle school teacher. I am trying something new. I have a "pencil up" process. 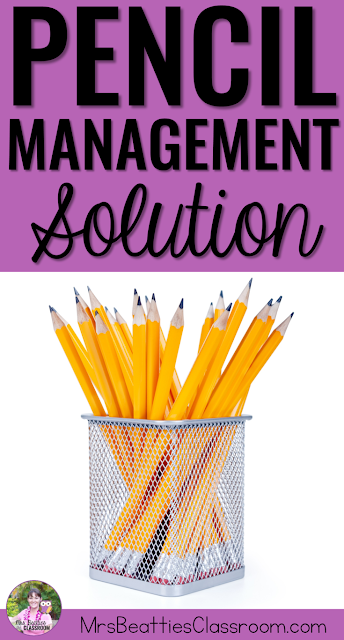 When a student needs a pencil, typically a student gives away one that is really used. So I allow them to "pencil up". The student who is responsible and gives the used one away, get the brand new pencil from me. We have had a couple times where the child has "LOST" their bag. I told them to look in their desk. I've looked in their desk couldn't find it. Finally started taking everything out and there it was. Blending into the bottom. Our bags are black with a white number but you couldn't see the number so it blended into the black bottom. I love this idea and would like to use it this year! My only concern is time. How long does it take your helpers to go through all the pencil pouches, sort and sharpen pencils, and add in treats? I have my helpers do this on Fridays during the lunch recess break. I would estimate that it takes them between 20 and 30 minutes, depending on how focused they are. My helpers were younger this year, so it took them a little longer than the 8th grade helpers. It really just depends on your help! I switched to pens (yep, even for math) a few years ago and never looked back! It's been my favorite management/procedures change in 13 years of teaching elementary school. The learning curve is quick, and kiddos who use their pens incorrectly are asked to just use a pencil for the rest of the day. This curbs the problems almost immediately. I do a little instruction first on crossing out answers instead of scribbling, which is great because then I can see their mistakes. It's harder to convince the parents of the transition than the kiddos, they love it! Interesting! Thanks for stopping by and sharing your thoughts! 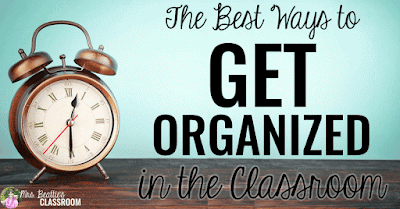 I've been teaching for more than 20 years and this idea was a game changer for me! I love that it helps increase respect for property, and helps children become more responsible. Thanks for sharing! I did this with middle school - 1 pouch per group in each of my 4 classes. It worked for a while but some kids were sneaking pencils from other classes- (the pouches hung from hooks behind their group of desks- I refused to be the pencil police so i scrapped the idea). . I’m thinking of trying it again but having a student pass out the pouches to each group and me collecting them with a quick check at the end of class. They are clear so it is easy to see that there are the correct number of pencils. I made each student supply 1 pencil and I added 2.